The United States has a long, and at times, contentious history with taxation that even predates the founding of the country. Going all the way back to the days when the U.S. was a British colony, citizens were pushing back on what they saw as an unfair tax system. The protests around “taxation without representation” eventually led to the American Revolution and the birth of the United States. Today, there aren’t many citizens dumping tea in the Boston Harbor in protest, but when tax season comes around, plenty of Americans still get a chill up their spines. Even the most stalwart supporters of federal taxes have been known to at least let out a very heavy sigh when they think about doing taxes. The fact remains that taxes are a necessity within the United States’ governmental structure. Federal funding supports the military and defense, public schools, and important infrastructure components. Without those taxes, the United States would be a very different place. A perceived silver lining in all this is that the modern tax system is set up so that the majority of Americans receive a refund for the taxes they paid the previous year. Below is our list of the 10 states where taxpaying residents received the highest average tax refund amount for 2017. Refunds ranged from an average of $3,260.71 to $4,445.34 — a difference of $1,184.63 between the No. 10 state and the No. 1 state. The states represented in the list vary widely in population, median income, and geographic size. The largest tax refund amounts were also not confined to any specific region — the states that made the list stretched from the Northeast coast to as far west as Texas. Known for its distinct Cajun flare and quirky culture that spreads from New Orleans in the south, Louisiana ranked as the state receiving the 10th highest average federal tax refund in 2017. Residents of the Pelican State received, on average, a return of $3,260.71. Louisiana taxpayers collectively filed 3,161,283 federal tax returns with 1,640,935 of those filings receiving refunds. The federal government collected nearly $43 billion in taxes from Louisiana residents and refunded just over $5 billion. The U.S. Census Bureau estimated Louisiana’s population at 4,684,333 as of July 1, 2017. Among the state’s top industries are oil, natural gas, and commercial fishing. Although the state ranks high for average tax refund amounts, its median annual income, at $43,903, is the lowest on our list. The good news is that, with a cost of living below the national average, Louisiana residents’ tax returns will go further than those of residents of other states. The next state on our list is…not a state. But residents of Washington, D.C., the United States capital, pay federal income taxes just like residents of the 50 states. D.C. ranks ninth on our list with an average federal tax refund amount of $3,330.32. D.C. has the lowest population on the list with a 2017 estimate of 693,972, but the city still has more residents than the states of Vermont and Wyoming. The IRS counted 603,784 tax returns filed by residents of D.C. in 2017, with 283,179 of those seeing refunds. Overall, with a total of just over $943 million refunded, D.C. received the least amount of tax refund dollars than other entries on our list. As the nation’s capital, federal jobs are common in the D.C. area, but tourism/hospitality and education are also major industries for the city. These industries are boding well for D.C. residents it seems because at $83,382, the District boasts the highest median income on our list. Coming in at No. 8 on the list is New York with an average federal tax refund of $3,457.67. When most people think of The Empire State, the bustling streets and skyscrapers of Manhattan come to mind, and with good reason. Although the state capital is Albany, located 150 miles north of Manhattan, New York City’s thriving financial, advertising, and media industries help lead the state economy and would actually rank in the top 20 largest economies in the world if it were a country. New York residents filed 16,083,546 tax returns in 2017, and 7,860,621 saw refunds. The federal government collected just over $268 billion from its 20 million residents and refunded about $27 billion. Even with its thriving economy and large population, New York’s median income of $62,447 doesn’t particularly stand out in this list. Although $3,400 is a respectable amount, with New York City’s notoriously high cost of living, don’t make any plans to move to the Big Apple just for the potential tax refund. Up next is Illinois, with an average federal tax refund of $3,525.46. Like New York City in New York, Chicago dominates the Illinois economy. Home to 29 Fortune 500 companies, numerous transportation and distribution centers, financial and insurance companies, and manufacturers, Chicago is a city of industry. But other cities in the state, like Peoria, or its capital, Springfield, typify a more laid-back midwestern culture. Illinois residents filed 10,018,880 federal tax returns in 2017 with about half of those — 5,067,372 — receiving refunds. Overall, the U.S. government refunded $17,864,830,000 to Illinois residents in 2017. At $64,609, the state’s median income comes in just above New York’s. Illinois is the second most populous state on this list with an estimated 12,802,023 residents in 2017, and it holds the sixth-highest population of the United States. Roughly one-quarter of the state’s population is located in the Chicago area. At $3,713.98, Oklahoma has the sixth highest average federal tax refund amount on our list. With a population of 3,930,864 residents, The Sooner State is the 28th most populous state in the U.S., but one of the most geographically diverse. Nestled primarily between Arkansas, Texas, and Kansas, Oklahoma contains subtropical forests, mountain ranges, and part of the Great Plains. Out of its nearly 4 million residents, 2,688,045 filed federal tax returns in 2017. Again, roughly half of those returns saw a refund. Overall, the federal government collected around $27 billion in taxes from Oklahoma residents and refunded about $5 billion. Oklahoma’s cost of living is slightly below the national average, but, perhaps accordingly, the state’s median income is the second-lowest on our list at $55,006. Energy, agriculture and biosciences, and aerospace and defense are among the top industries in the Oklahoma economy. Minnesota — the northernmost state on our list — had the fifth highest average federal tax refund in 2017 at $3,846.03. Despite its propensity for bone-chilling temperatures, Forbes ranks Minnesota as the state with the third-highest quality of life measurement. This is due, in part, to a generally healthy and educated population, plenty of recreational activities, and a strong economic climate. Much of its strong economic base is in the Minneapolis-St. Paul metro area, where 65% of the state’s estimated 5,576,606 residents live. In 2017, the IRS counted 4,488,452 Minnesota tax returns, with 2,149,182 of those receiving refunds. The federal government collected just over $100 billion in taxes from Minnesotans and refunded around $8 billion. With a median income of $71,920, a healthy average tax return, and its high quality of life ranking, Minnesota has a lot going for it on this list. Notable companies like Target, UnitedHealth Group, and 3M call Minnesota home. And the state is the country’s largest producer of sugar beets, sweet corn, and green peas. Everything’s bigger in Texas — even its tax refunds. The largest of the country’s contiguous states comes in fourth on our list with a 2017 average federal refund of $3,949.48. The Lone Star State boasts the nation’s second-highest population, which was estimated at 28,304,596 in 2017, only below that of California. Of the 19,239,468 Texans who filed tax returns in 2017, a little more than half — 10,286,833 — received refunds. Texas has the country’s second-largest economy, again, only surpassed by California. If Texas were a country, it would have the 10th largest economy in the world. Its big economy and big population result in a whopping $271 billion collected in taxes by the federal government and more than $40 billion in refunds. 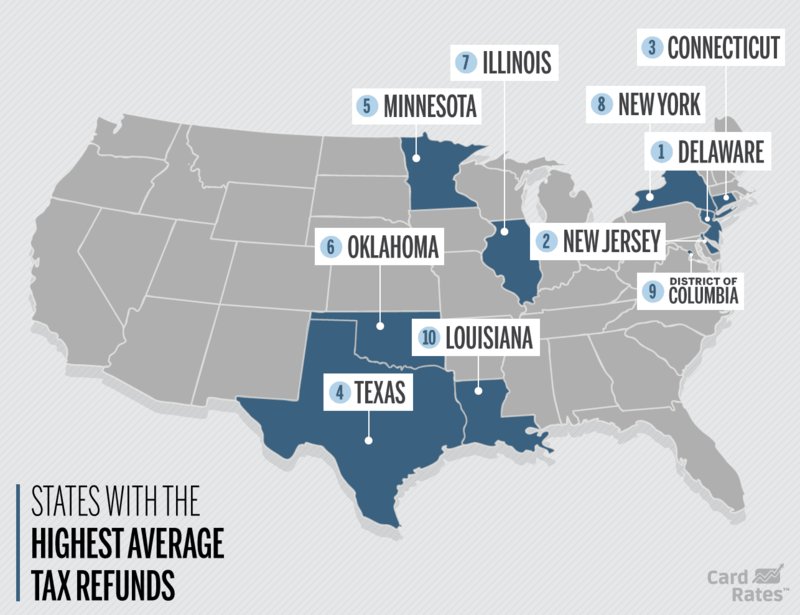 For our top three highest average tax refunds, we move back to the Northeast, where Connecticut ranks No. 3 on our list. The Constitution State eeks into the next level of federal tax refunds with an average of $4,000.87. Of the 2,931,144 Connecticut residents who in 2017 filed federal tax returns, 1,422,410 saw refunds. 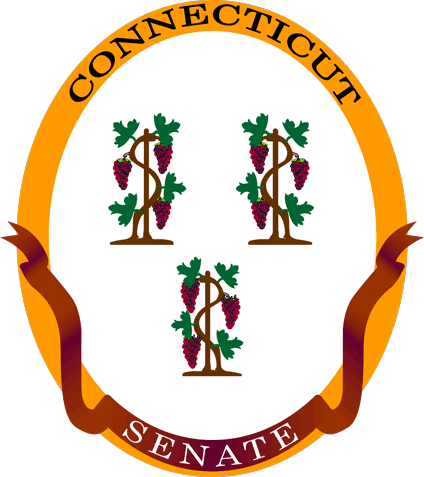 The U.S. government collected more than $57 billion in taxes from Connecticut residents and refunded nearly $6 billion. With a population of 3,588,184 — considerably smaller than our previous entry — Connecticut’s 2017 median income was an impressive $72,780. Financial services, healthcare, large-scale manufacturing, and digital media are among the top industries in Connecticut. But, it is worth pointing out that income inequality is a major concern in the state. Additionally, the cost of living in Connecticut is considerably higher than the U.S. average. While a larger tax refund is nice, it may not go very far in Connecticut. New Jersey ranked No. 2 in the nation for its average federal tax refund amount of $4,152.99. The state’s median income is also the second-highest on our list, at $72,997. Pharmaceuticals, financial services, and telecommunications are just a few key economic drivers for the state. Of course, many New Jerseyites in the eastern part of the state make up the bridge and tunnel crowd, who commute to jobs in New York City. New Jersey filers submitted 7,398,401 tax returns in 2017, and 3,539,771 of those received refunds. The federal government collected nearly $144 billion in taxes from New Jerseyites and refunded close to $15 billion. Although The Garden State boasts a high median income, it is one of the most expensive states to live in. For the most part, the priciest areas are along the state’s eastern border. The counties adjacent to Manhattan Island and farther south on the Atlantic coast contain some of the most expensive ZIP codes in the U.S.
Coming in at No. 1, with the 2017 highest average federal tax refund amount is Delaware. On average, Delaware residents received a hefty $4,445.34 tax refund. Of the state’s estimated 961,939 residents, 788,036 filed tax returns for 2017, and 375,420 received refunds. Overall the federal government collected just over $17 billion in taxes from Delaware residents and refunded a little more than $1.5 billion of that amount. Delaware’s median income for 2017 was $62,318, which is just above the national median income of $59,039. And Delaware’s cost of living — though slightly higher than the national average — is lower than many of the state’s neighbors in the northeast, making for a nice place for residents to get the most out of their tax refunds. To create this ranking, we combed through 2017 IRS tax data for each state and divided the amount of Internal Revenue refunds issued, including interest, by the number of Internal Revenue refunds issued to identify the average refund amount for all 50 states and the District of Columbia. We also explored income and data figures from the Tax Foundation and the U.S. Census Bureau.